Episcopal Relief & Development and the Anglican Church of Burundi join with Cornell’s College of Agriculture and Life Sciences to provide field study opportunities and feed communities. Their scientific contributions have expanded and reinforced farming capabilities in the pilot communities, especially for women engaged in the kitchen gardens project. Episcopal Relief & Development, in partnership with the Anglican Church of Burundi, is joining with Cornell University’s College of Agriculture and Life Sciences to provide field study opportunities for students in the International Agriculture and Rural Development (IARD) program. With high population density and hilly topography, Burundi faces chronic challenges in maintaining food supply. Soil erosion, crop disease, limited seed supply and lack of market access contribute to the country’s ranking last out of 78 on the International Food Policy Research Institute’s most recent Global Hunger Index. Supporting the growth of the Church’s Sustainable Livelihoods Program, which works with farmers to improve agricultural practices, diversify harvests and restore soil quality, this operational research partnership provides field study placements of two to four months for both graduate and undergraduate students. Two students have completed their placements so far, and funding from the Andy Paul Africa Initiative Fund through the Office of Cornell’s Vice Provost for International Affairs will enable at least four more students to participate in coming years. In Burundi, the partnership enables the Sustainable Livelihoods Program to expand and improve project activities, with the aim of reaching approximately 100,000 households nationwide by 2016. As part of the project, women in rural areas are taking action to reduce hunger and improve diets for their families by building small “kitchen gardens” in their yards. The gardens, which have grown to number more than 1,100 in less than a year, are planted with vegetables such as leafy greens, eggplants, pumpkins, tomatoes and watermelons. They serve as an addition to the small, hilly plots (less than one hectare, approximately two city blocks) that the families farm with corn, beans and potatoes. The particular focus of each student placement term depends on the individual’s knowledge and interests, but includes topics such as agricultural methods, family nutrition, soil and erosion management, crop disease management and seed access. Strategic evaluation of program activities through surveys and other means will enable project leaders to assess impact, identify challenges and communicate results. Episcopal Relief & Development’s partnership with the Church of Burundi aims to provide high-quality support to farmers, enabling them to preserve their land, maximize its productivity and reduce malnutrition, especially for children under age five. The research partnership with Cornell will provide robust data on program activities and impact, in order to shape future plans for improved outcomes, and valuable cross-cultural experiences for both students and program participants. 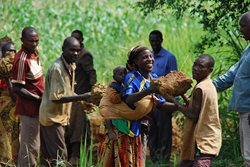 Comprehensively, the Sustainable Livelihoods Program of the Anglican Church of Burundi aims to transform livelihoods through support in the areas of agriculture and the environment, water and sanitation, gender-based violence and health. In 2014, the program reached approximately 22,000 people in eight provinces.